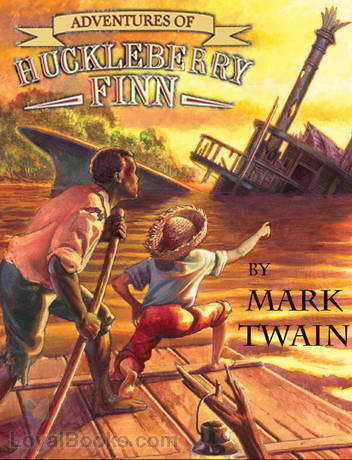 While Reading Huckleberry Finn by Mark Twain I have been pulling out samples of the text and analyzing them to make deeper connections inside and outside of the text. Here is just one example of my work with the Dialectic Journal. “I had to shut the door to. Then I turned around, and there he was. I used to be scared of him all the time, he tanned me so much. I Reckoned I was scared now, too; but in a minute I see I was mistaken- That is, after the first jolt, as you may say, when my breath sort of hitched, he being so unexpected: but right away after I see I warn’t scared of him worth bothring about.” pg.17 chp.5 In this first opening paragraph of chapter 5 Huck describes seeing his father for the first time in a long while. He states that his father was abusive and that he used to be scared of him since he beat him so much. This gives us a lot of insight on huck’s past and why he is with the widow instead of his parents. We already know that his father is a drunk but now it is safe to infer that since word has gotten out about huck’s fortune that his father wants a part of the deal. Also since the story take place in the late 19th century many homes were easy to get into and theft was more common than it is today. Also the fact that Huck does not run from his father or call for help sheds a lot of light on their relationship. Dialectic Journal Entry by Grant is licensed under a Creative Commons Attribution-ShareAlike 4.0 International License. I agree with everything everyone has said. This time period was a time where it was okay to beat people and punish your children for not listening. Huck shows that he is big and strong enough to no longer fear his father. I agree with both Evan and you, that abusive relationships are a big theme in this book. This chapter gave us a lot of Huck’s past which was helpful to understand why he disliked his father. I also liked how you brought Huck’s fortune into your writing and how his father was just going to use him for it. I agree with you that a major theme of the book is abusive relationships. It has caused Huck to have the personality that he has. I would push you to figure out what Huck defines as an abusive relationship.